Bina007 Movie Reviews: GRAND PIANO - LFF 2013 - Day Six - Absurdly Late Review! GRAND PIANO - LFF 2013 - Day Six - Absurdly Late Review! One of the films getting the most buzz at this year's London Film Festival is Damien Chazelle's music lesson slash thriller WHIPLASH starring J K Simmons. 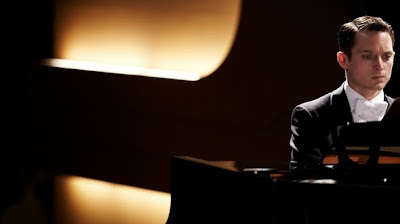 And as luck would have it, the movie he penned, GRAND PIANO, is on release this week in the UK. The similarities are striking - a thriller set in the world of classical music. And while I didn't manage to watch it at last year's LFF, I did catch it today on its theatrical release. Anyways, as the thriller unfolds we can an increasingly paranoic soundscape - phone conversations we can't quite hear the other side of, instruments tuning up cluttering the pianist's attempt at calm - and finally the concert itself. The conceit of the film is that in the midst of the recital the pianist finds himself in the site of a sniper threatening to kill him should he play one wrong note. Think of it as SPEED for the Wigmore Hall set, filtered through the lens of giallo. There has to be a certain BLACK SWAN suspicion that the musician is just imagining his greatest fears as vocalised by John Cusack. But pretty soon it becomes clear that the threat is real, even if the prospect of a pianist seemingly talking to himself on stage, running off and back on, doing a tour de force encore and then asking his wife to sing some kind of soupy popular ballad isn't. In fact, I think I can pinpoint the exact moment when GRAND PIANO jumped the shark and it involves some hammy over-acting by Downton Abbey's Allan Leech and Tamsin Egerton. Does this kill the film? I think it depends on whether you're willing to go down the rabbit hole of Giallo homage with the director. If you're a fan of split screen shots, spooky mirror reflections, hugely melodramatic close-ups and general gonzo mayhem, then this movie is actually rather brilliant. Even the fake classical music references Rach, Tchaik and other famous concerti. This is then, essentially, a movie for lovers of a certain kind of schlocky 80s thriller and taken in those terms its technically accomplished but cheesy fun. However, I pity the poor fool who walks in unprepared, expecting something more mainstream and credible. GRAND PIANO has a running time of 90 minutes. GRAND PIANO played Sitges 2013 and will be released in Spain on October 25th. Scratch that - GRAND PIANO is on release in the UK NOW!